Cream had begun serious rehearsals in June 1966. On July 31st they headlined at the National Jazz and Blues Festival. Soon afterwards they entered the primitive Rayrik studio to record the obligatory smash single. Unfortunately they were somewhat short of original material. 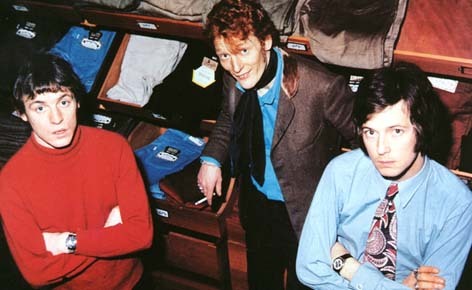 Eric had his blues covers and Ginger and Jack some of their material from the Graham Bond Organisation. Most likely Robert Stigwood proposed the Tin Pan Alley like "Coffee Song". To maximise financial return, original songs were required as song writing royalties offered the best long term income. Jack had some original tunes, most of which were deemed unsuitable. One example is the outtake "Beauty Queen"  at best a song requiring a lot of development. While Jack and Ginger could come up with music and arrangements, lyrics remained a problem. Ginger invited the poet Pete Brown to help him out but Pete immediately formed, what has become, a long-lived partnership with Jack. Pete set some words to some of Jacks tunes, one of the earliest being "You Make Me Feel" with its decidedly goonish lyrics which, again, was not developed beyond the rehearsal outtake. Another effort was deemed suitable and work began on the A Side of the single. The rehearsal outtake, during which Jack and Eric crack up over the trite melody, says it all. They completed it with, probably, some additional overdubbing in December. Planned for inclusion on the album it was sensibly dropped but did appear on some European EPs. This is available in multiple mixes - mono, basic stereo, stereo (Fresh Cream reissues). The crude stereo is instructive - all the basic recording is hard right (a mono mixdown) with the solo guitar overdub hard left. When remixed into steeo the mono mix was centred with the guitar paniing left-right for each alternate break. Began as a co-operative development but published as a Bruce/Brown composition. This still sticks in Gingers craw to this day. A clear attempt at a piece of clever pop reflecting the dominating influence of the Beatles in the industry. The rehearsal outtake provides a pretty clear indication of how they were struggling to get the production together within the limitations of the studio and the notional producer. In an era when the 3 chord trick (2 chords for the chorus, 3rd on the bridge) became standard, Jack provides what sounds like a seemingly simple song. It is has a 12 bar structure, but it is not a blues, and a mere 9 chords with 14 changes in the 12 bars. The solo is also distinctively non-blues of slide like guitar notes (very similar to "On Top of the World" from 1965) with Arco bass. Outtakes: "Beauty Queen", "You Make Me Feel", "Coffee Song", "Wrapping Paper" (rehearsal and alternate). At this stage, the demands of touring intruded and no B Side was completed. Also this was probably the studio that Ginger accidentally spilt Coca Cola into the mixing panel. The combining of "Wrapping Paper" and "Coffee Song" was probably considered too blatantly poppy. September 1966, Ryemuse Studios (Spot Productions), Mayfair, London. Moving to a marginally superior studio, they completed the B side of the single and also completed its follow up. S. Splurge was a group pseudonym to spread song royalties, except to Dr Ross. A tight and exciting rendition with the riff appearing regularly in the extended jams of the next year. A simple song that shows what you can really do with one chord! The rehearsal outtake lacks the harmonica/guitar overdub (Eric does the lead break as part of the basic guitar line) but it still stands up  raw and rough. The alternate master was released on a French EP and has an alternate lead overdub. It is unclear why this wasnt used but probably Eric was not satisfied with his lead break. The single was released in October, and only reached 34 on the UK charts, hardly auspicious for a band of their reputation. The next attempt at a single was musically a lot heavier with Jack now becoming more assertive as Ginger pushed Stigwood out of the production role. While it opens with clever multi-tracked harmonies, it is the bom-bom-bom of the drums that leaps out at you. This was insisted upon by Jack despite Gingers "you're mad". Jacks arranging experience with the pop production line of Manfred Mann was paying off. Eric pulls off a fine solo and Pete provides lyrics about dancing. A minor classic that was found to be far more acceptable and reached 11 on the charts. The rehearsal outtake indicates the difficulty they were having in devising the correct recording approach. The incomplete master is the basic track before the additional overdubbing. Really shows they needed a proper producer. Unfortunately this was to be Pete Browns last contribution to the session. He had entered a clinic ("In a white room with black curtains...") after becoming strung out. From this time Pete eschewed all intoxicating substances - his lyrics are a product of his true mind. The B-side shows only the proto-elements of the heavy rock classic it was to become in 12 months time. At best a transition song  pop rock with lyrics about the joys and dangers of being a sexually active young man. October 1966, Ryemuse Studios (Spot Productions), Mayfair, London. The year was slipping away and an album was required for Christmas. They had built up a solid set of numbers for performance and now moved to capturing their live sound. Janet Godfrey, Jack's wife, had capably taken up some of the lyric writing slack. A slow blues in 12/8 time. It continued to be played on tour during 1968 without any signficant change in arrangement, except marginally extended length. The alternate master was released on a French EP and has an excellent solo from Eric. This was later redubbed as there is some pick-striking-pickup noise on the alternate. Pretty much a Jack Bruce solo effort with a feel and sound that continues in his career today. Involves 14 chords and done in ¾ time. Ginger didnt get Pete for his lyric writer but Jacks wife! Like NSU there is barely an inkling of the live monster that was to come. The three alternate versions are quite illuminating. The rehearsal has Jack fluffing the lyrics but shows them laying down as much as possible in the first dub  bass, drums, guitar and vocals. Fundamentally a live approach that left 2 tracks for overdubbing  usually guitar, harmonica and, sometimes, additional vocals. The 2nd rehearsal was reputedly recorded after Jimi jammed with them at the London Polytechnic (Oct 1). Jack is playing up loud and Eric is trying to coax feedback from his Les Paul. His limited success may have made him try out the SG. The legend of this outtake far exceeds the reality, as does the quality of most versions. The incomplete master was released on the French EP. It lacks the lead guitar overdub, which is the clearest example of their, now, faster recording process as they worked to get the album out. November 1966, Ryemuse Studios (Spot Productions), Mayfair, London. It is really an acoustic rendition, except for Eric sticking to electric guitar. The alternate is an early mono mix that was released on a French EP. The classic Muddy Waters song covered by many and rudely ripped off by the Jimmy Page led Yardbirds. The alternate master is also excellent, but not used as there is some feedback on the harmonica at one point. In the studio but done just like they were live. The live 1968 version is only longer with no significant variation in arrangement. Conceptually under development from the Graham Bond days. The rehearsal outtake is just that and lacks the guitar solo intro. That drum solo simply just doesnt flow. The released version is a classic and destined to be a live monster within 12 months. More of a folk song than a blues, which was heavily rearranged. Became a staple of their live performance to the very end. Something about this song always seemed to bring the best out of them. This was only mixed to mono, no stereo mix exists. The alternate lacks the lead guitar overdub, which indicates that it wasnt completed till December. At this stage it appears that several tracks were pulled together to release in France as a tour was booked for December that included TV and radio appearances. Two EPs were released which contained alternate masters, mixes and incomplete masters. In early December the returned to the studio to complete the album. Almost live in the studio with only the harmonica overdubbed. The longest track on the album and destined to get longer. A classic rendition which has been widely emulated. Their confidence is now high and they play it loud (John Timperley seems to have mastered the techniques required). Speculation: quickly done to push out "Coffee Song"?. It is likely that additional dubbing was carried out on "Coffee Song and "Sweet Wine" and some of the solos redubbed  "Sleepy Time Time", "Cats Squirrel" plus "Im So Glad" completed. Mixing of the Fresh Cream album was completed on 8th December. Production of this album is credited to "Robert Stigwood Productions". The reality is that it should be credited as "Cream & John Timperley". The basic production technique had been to record basic guitar, bass, drums then mix down to a mono recorder, transfer to 4 track again for more overdubbing. Thus one finds the guitar/bass/drums mixed left and overdubbing right. Exceptions to this rule were Spoonful (live to 2 track then overdub on other 2) and Toad (live guitar/bass left and drums right, guitar solo overdub). I'm So Glad is a mono mix which has been 'enhanced' on some vinyl releases. The UK album included "Spoonful" but not "I Feel Free" and the US a remixed "I Feel Free" but not "Spoonful" which was released as a two part single. "Coffee Song" was listed for inclusion (Stigwood again!) but thankfully dropped. The album met with considerable critical and chart success reaching no 6 in the UK. While not reaching high on the US charts, it never the less sold steadily through 1967 and was highly influential.